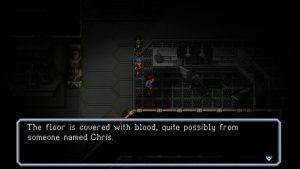 Cosmic Star Heroine doesn’t quite hang with the company it was inspired by, but it comes close in some ways and manages to carve a little corner for itself in the combat department. 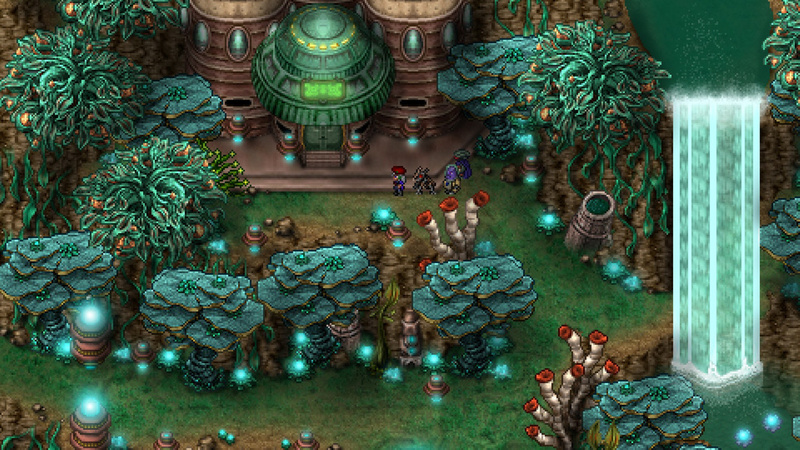 The overworld maps are small but beautiful. 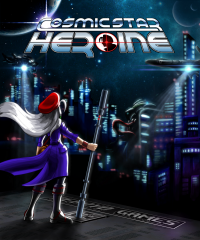 One glance is all it takes to figure out that Cosmic Star Heroine is a turn-based JRPG inspired by 16-bit classics like Chrono Trigger and Final Fantasy VI. The visual style is a wonderful replica of those games, updated just enough to look good in 2017 but still feel like its inspirations. The overall structure is also familiar, primarily modeled after Chrono Trigger’s overworld maps and smaller linear areas with minor exploration for treasure chests. 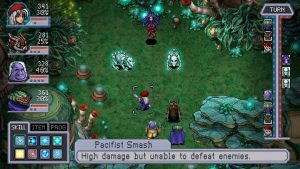 Although I was honestly looking forward to a straight ripoff of Chrono Trigger’s battle system, Zeboyd Games surprised me with brilliantly designed combat that feels wholly unique. Visually, it looks like a mashup between Chrono Trigger and a Trails game, but the only mechanical similarities to either of those are a few team attack skills and a turn order gauge. Neither of those mechanics are interesting in this game, which was initially disappointing, but the rest of the combat more than makes up for that. 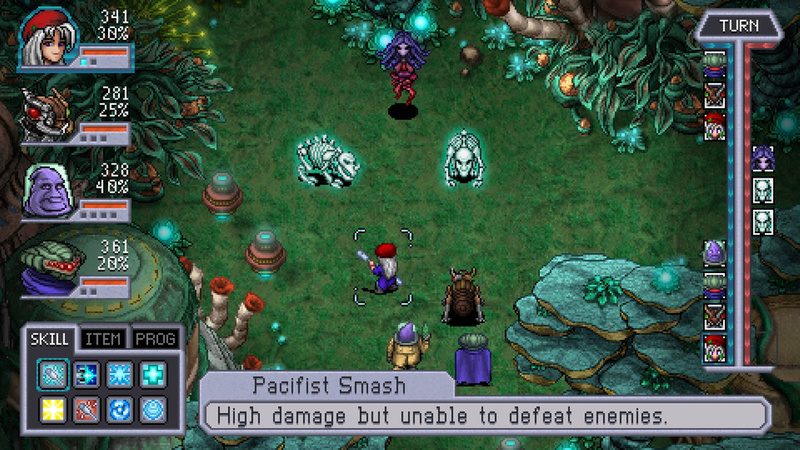 The battle system combines several different mechanics to create a satisfying flow that requires planning and strategy to get the ideal outcome. On Heroine difficulty, which I highly suggest playing on, most battles require full use of these mechanics to survive. 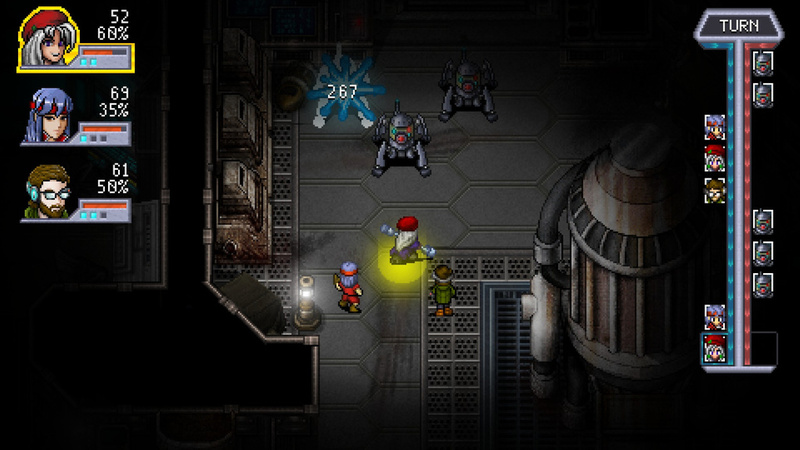 No mashing the button to attack, attack, attack until the enemy is dead in this RPG. First and foremost, each character has an arsenal of diverse abilities that range from simple physical attacks, buffs, debuffs, and healing to more unique abilities like background auto-attacks that do damage once per turn. Once an ability is used, it can’t be reused until that character burns a turn to defend and recharge all of the abilities. At the same time, each character also has a Hyper Meter that fills with each turn. When full, which only takes a few turns then resets, Hyper Mode doubles the effect of any ability for that turn, no matter what it is. Since you know exactly when Hyper Mode is going to engage, the flow of combat revolves around preparing each character to make the most of that one turn. You don’t want to be stuck without any useful abilities in Hyper Mode, so it’s imperative to plan out each character’s moves a few turns ahead in order to avoid wasting the bonus effect. For example, if an enemy is weak to water, saving a water ability for Hyper Mode will cause major damage. If you’ve also buffed that character in preparation, the damage can be massive. Finally, each character has a Style percentage that increases with each ability used in battle. The damage from certain attacks is directly affected by the Style percentage, so those are most effective late in the battle when the damage multiplier is highest. Also, if a character has 50% Style or more, an otherwise lethal blow will send their HP into the negatives, and they’re allowed one more turn to either heal back into positive HP or launch a Desperation attack that does more damage than usual but leaves them dead afterwards. As the game progresses, you earn more abilities through leveling up and acquire more party members to slot into your team. The strategies get more complex as the enemies use more abilities, and it manages to feel fairly fresh all the way through. With no grinding required and all characters completely restored after each battle, the whole system is fun and user friendly. 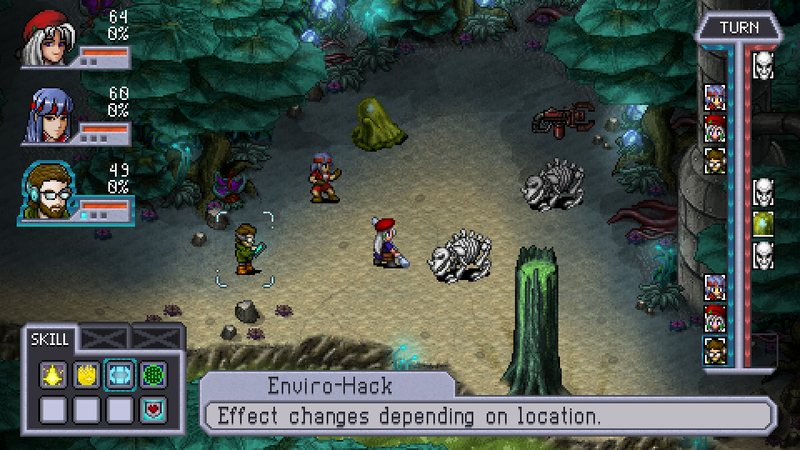 If a good turn-based combat system is all you need out of a 16-bit-style RPG, then Cosmic Star Heroine is a great value. At 10-15 hours, it has just enough content to not overstay its welcome. Unfortunately, the story—typically the driving force of this kind of RPG, especially for me—falls flat on nearly every level. Alyssa L’Salle, an agent of the cyberpunk-future Agency of Peace and Intelligence, stumbles upon a secret mind-control project organized by the Agency itself. With a couple of friends from the Agency and several more they pick up on the way, she follows the trail of this project in order to stop it before it’s too late. This premise has potential. Even the characters have potential. The problem is one of tone. It doesn’t take itself seriously enough to give weight to the plot, but it isn’t ridiculous enough to be entertaining, either. The characters have personalities but no personal connection to the plot, so it all feels disjointed, like they’re just caught on a wave and commenting on the scenery as it passes by. Overall, the storytelling suffers from a certain carelessness that leaves it feeling lifeless, especially when it looks so similar to such classics as Chrono Trigger and Final Fantasy VI that have unforgettable stories and characters. It took me two playthroughs and an epiphany to realize this was a vague reference to Resident Evil…. That’s not to say that the story is horrible, but be aware that it isn’t enough to provide incentive to keep playing. The combat is the only driver here, so luckily, it’s a really good driver. In the end, however, the dull writing—as well as its random references to games that have seemingly nothing to do with this one—put a significant damper on my enjoyment of the game as a whole. 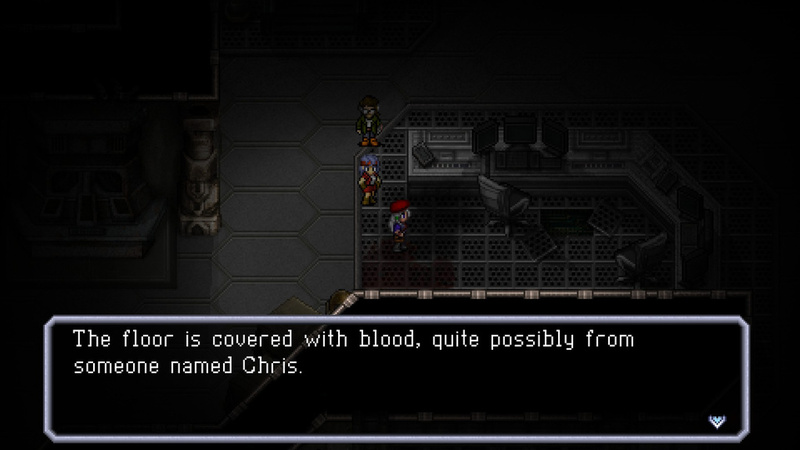 With more work on the story and writing, Cosmic Star Heroine could have been an incredible game. At the very least, it contributes a fantastic new battle system to the world of old-school RPGs. Zeboyd Games is certainly talented, and hopefully they’re able to pull all the elements together to create something fantastic in the future. A review code for the PC version of the game was provided by the developer. massive elements not even really reviewed here, not sure how it can be a fair review without taking into consideration the amazing artwork, attention to detail on sprit animation really pulls you back to THAT era of gaming in at least my childhood, but with a greater polish on it imho. Great cutscene detail, fantastic soundtrack, nostalgic battle sound design (albeit clearly not all coded in or made since it sounds like some is just flat out missing, come on devs, really?). Anyway, seems like you focused on two things only here, great battle system, and you didn’t like the story personally. Id humbly recommend you give our future reviews a bit more depth into all the aspects that a game should be reviewed on. I chose not to focus the text of the review on the visuals and animation because that stuff can easily be seen in screenshots and trailers. No need for me to explain it in detail when a simple “it’s wonderful” will do. The final score is my overall impression, which takes everything into account, whether I spent a lot of time on it in the review or not. I hope that clears it up a bit. Thanks for reading!